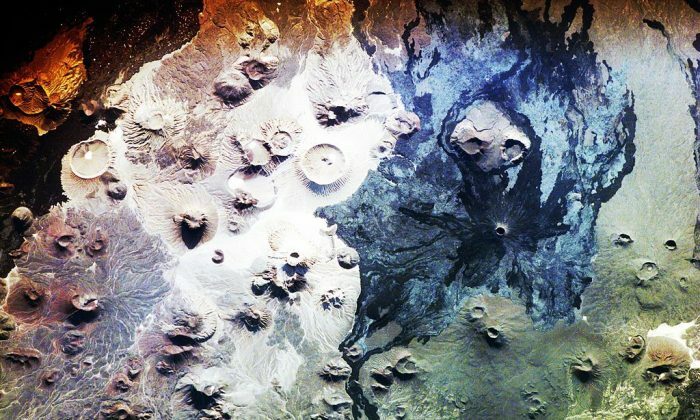 A professor of archaeology at the University of Oxford discovered around 400 mysterious stone structures on and around volcanoes in Saudi Arabia. David Kennedy found the structures, using Google Maps, in the western Harrat Khaybar region. The walls could be more than 9,000 years old—which would make them older than the famous Peruvian Nazca lines—according to The Independent. People have started calling the structures “gates” because of their appearance from satellite imagery. Many of the so-called gates sit atop ancient lava domes—dried mounds of lava found near volcanoes, and scientists think they can get a more accurate idea of the age of the gates by analyzing the lava. Traces of lava are on the gates themselves. The volcanoes in the region are currently inactive. “Gates are found almost exclusively in bleak, inhospitable lava fields with scant water or vegetation, places seemingly amongst the most unwelcoming to our species,” said Kennedy, via Express. The longest one is 1,699 feet while the shortest is approximately 43 feet. Some of the gates are miles apart in distance while others are nearly touching. They “occur throughout the entire Arabia region, from Syria across Jordan and Saudi Arabia to Yemen,” wrote researchers in the Journal of Archaeological Science. They are thought to be ancient stone traps for migrating birds. They are often found on top of the gates, which suggest they are not as old. “Wheels” are another structure found on top of the gates and scientists believe they are around 8,500 years old, Live Science reported. The studies of structures like these in the Middle East have occurred almost exclusively through satellite imagery. Actual field study is needed to further unravel the mystery, but a remote, inhospitable environment ensures archaeologists have their work cut out for them. “We tend to think of Saudi Arabia as desert, but in practice, there’s a huge archaeological treasure trove out there and it needs to be identified and mapped,” David Kennedy, who works as an archaeologist at the University of Western Australia, told the New York Times. Kennedy said it’s not exactly clear what the structures were used for. Jack Phillips contributed to this report.